We’ve got a great line up for you this week (the boxes are busting!) and an exciting announcement! Beginning now, you can join the summer season. Woohoo! You can sign up and reserve your summer share by logging in to your member account, switching the season to Summer 2018, and clicking to join on the right hand side of the screen. The Harlequin bugs are back! Those of you who remember the spring of 2014 will know that there are no organic pest control options that eliminate these little jerks, and that means within the next week or three, the brassica/mustard family of crops will be gone. This is why organic farming is hard, y’all. We’re trying to load your boxes up with this family of crops this week and next week in anticipation of their demise. Lettuce—Everyone received a couple of our lovely varieties, Romaine (Totally clean and healthy and NOT recalled! ), Cherokee, and Skyphos. Napa Cabbage*—This beautiful Asian cabbage is perfect for a fresh batch of kimchi. Grab some garlic, ginger, and radish and go to town. Pac Choi—Fantastic in stir fries, fried rice, asian noodle dishes, or a creamy yellow curry. If you want to just double your batch of kimchi, this crop will work great. Swiss Chard—Lovely fresh or cooked, chard is one of my spring favorites. Try our a fantastic method: massaged chard. Just follow the steps I outline here for massaged kale. When you’re done massaging add some dried cherries, citrus juice, olive oil, shaved hard cheese, walnuts, etc. and you’ll have an incredible new favorite salad. Cauliflower*—Y’ALL. We have NEVER grown such beautiful cauliflower. Please be thrilled with us that this crop was such a success this year. We’re so proud. Also…watch for caterpillars, we’ve definitely got some hitching a ride this week. Make this tasty cauliflower tart. It’s fantastic. Broccoli*—SUCH large shares of broccoli this week. We’re so happy to be able to give this much to you. We’re once again blown away by some of our crops this year! Scarlet Queen Turnips*— These lovely turnips are great roasted or boiled and served with good quality butter. Dandelion Greens—You can eat this crop with other salad greens, or turn it into somethin’ fancy! Give this wonderful dandelion pumpkin seed pesto recipe a try. Snow Pea—Crisp and juicy. These never make it very long in our kitchen. They’re all gone before I can get them washed and in the fridge. The many leafy greens will all last longest stored in the refrigerator, sealed up in bags or containers to retain their moisture. The root crops should be removed from their tops to keep the roots from getting rubbery. The tops can be stored like other greens. Everything will need a good washing before cooking, but leave the dirt on until you’re ready to use them. As a general rule, wait to wash any veggies until you’re ready to use them to help retain nutrients and prevent spoilage from excess moisture. We’d love to hear stories and recipes of your culinary adventures this week. 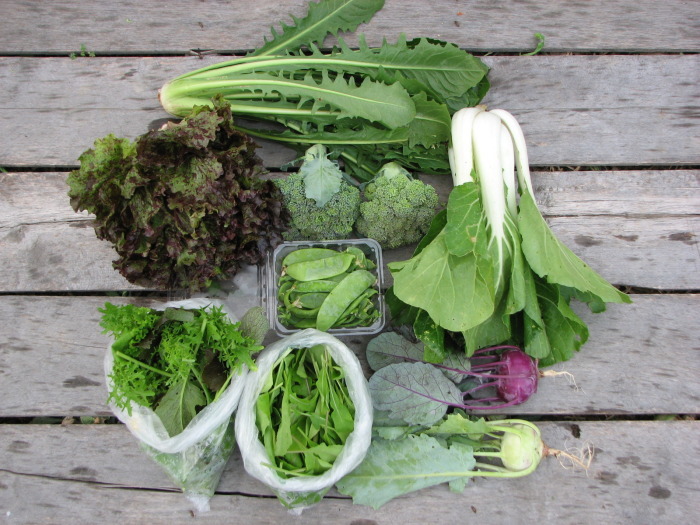 Send us a note or post a comment of how you’ve used your CSA share. 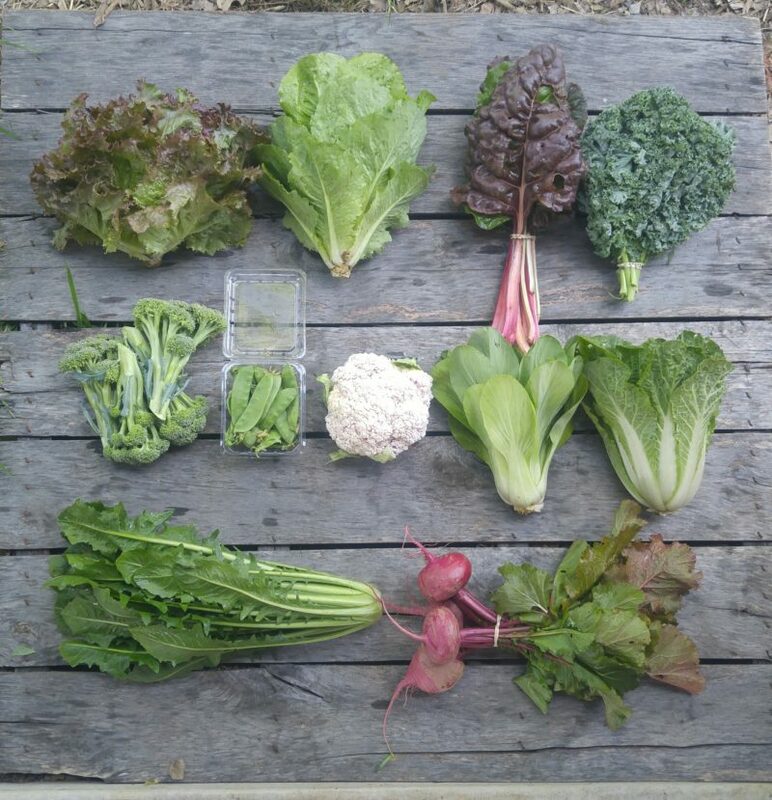 Large Share: (top row) Lettuce, 3 types, snow peas, dandelion greens (2nd row) Napa Cabbage, Swiss Chard, pac choi, cauliflower (3rd row) Kale, broccoli, and Scarlet Queen Turnips. 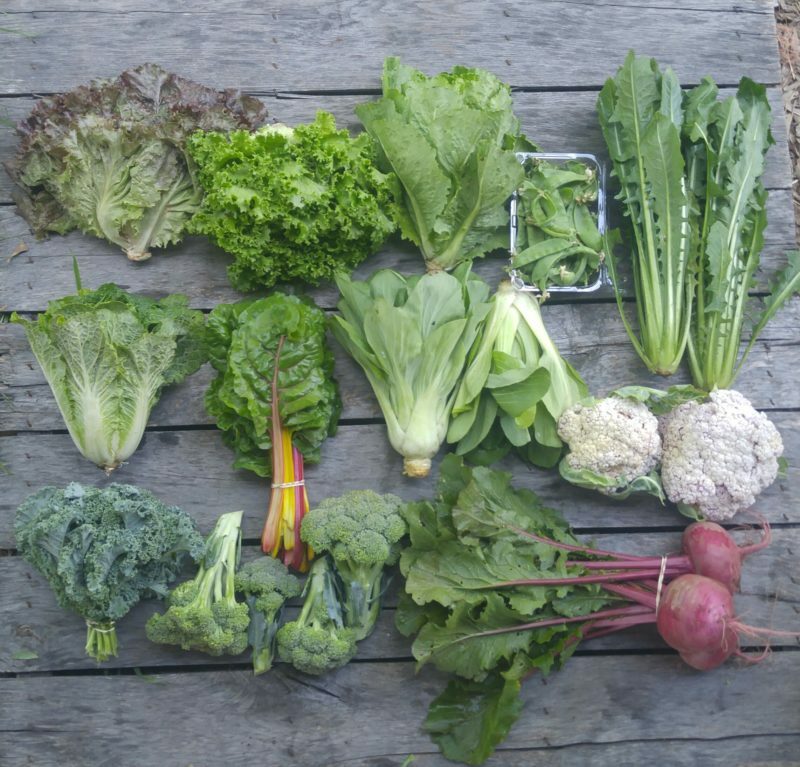 Small share: (top row) Lettuce, two types, swiss chard, kale (2nd row) broccoli, snow peas, cauliflower, pac choi, Napa Cabbage (3rd row) dandelion greens and Scarlet Queen Turnips. I was so excited to see cauliflower in this week’s share! It looked amazing and tasted even better! Twice I have received a bunch of flat, roundish green leaves about 4 inches across and 7 inches long. n I have never seen these before. What are they and how do I cook them. Are you using the images above to help you identify? It sounds like possibly collards. I made the dandelion pumpkin seed pesto. It is out of sight delicious. Thanks for the recipe!